Rather strangely, over the last two weeks, four people (you know who you are) have asked me about starting to sew, and have shown a genuine interest in dressmaking. Most, if not all of them have already own a sewing machine, but have generally limited their use to making cushion covers so far. These conversations get me extremely excited, but I never feel like we have enough time and space (at my mother-in-law's wedding, or at work) to discuss such a big and interesting topic, and it's never as easy to share the useful resources by chatting. So here it is, as promised, the blog post for what I would recommend to beginners. Where to start? Making your first garment will seem like a really daunting task. I remember when I started dressmaking a couple of years ago - so many questions overwhelmed my little brain. Should I make a top/skirt/trousers/jacket/dress? Do I buy fabric first or should I pick a sewing pattern first? What size do I choose? Do I need any other tools? What do all these markings mean on a sewing pattern? and how do I read the instructions? I am not going to attempt to answer all the answers here - instead, what I would suggest is getting a couple of helpful books. What you need is something that will not only teach you the basics, but also continue to provide great insights as your skills develop. The Dressmaker's Technique Bible is one of my favourite sewing books of all time. As the title suggests, this book is largely about sewing techniques, and indeed, this is my "go-to" book every time I come across a new technique. For example, I did a lapped zip recently, and after reading the sewing instructions from the pattern (which was clearly written), naturally I turned to the "bible", where the technique was beautifully illustrated by a series of pictures (in colour! ), and some wonderful tips (eg how to sew past the zip tab). I referred to it for the handpicked zip, too. In addition to sewing techniques, this wonderful book also has a helpful "getting started" section, which is perfectly comprehensive for beginners. I love the "body shape guide" and "fashion shapes", as they provide a useful perspective to choosing the right pattern for you. What's more, I just love the spiral binding, as I can just keep it open whilst using the techniques. Alright, you get the idea, it's a great book, go out and get it! You won't regret it! The next book that I think will be a good choice for beginners (and beyond) is The Colette Sewing Handbook. This is a rather new book (just over one year's old), and it is beautifully made (and spiral bound! ), and of course I wouldn't expect anything less from Colette! It's not often that I read a sewing book from cover to cover, but with this one, I did. I was amazed by how much I could just relate to the book. One of the main selling points of this book is that it contains 5 free Colette patterns - and these make the book excellent value for money. I won't go on any more now, as you'll find lots of detailed reviews of this book in the blogsphere. I'm sure you'll have come across this already, but Tilly has a Learn to Sew section on her blog, and is still expanding it. Go check it out! One of the things that I love about sewing is feeling part of a huge and incredibly welcoming and encouraging sewing community. One of the first sites that I joined was Burdastyle, where I found my first pattern - the coffee date dress (there's a multisize version too)! I couldn't believe how kind everyone was, especially with my far from perfect projects, most of which have now gone to my local charity shops. Much later on, I joined Pattern Review (PR), and immediately wished that I joined as soon as I started dressmaking. My advice here is, join it now! It is free, so what have you got to lose? You will have access to all the reviews of sewing patterns (I always check PR before deciding to purchase a sewing pattern), and more importantly, access to the wonderful forum where your questions will be answered by sewists from around the world, ranging from beginners themselves, to professional seamstresses. There are also a huge amount of tutorials on the blogsphere - it is very rare where I need to find a sewing tutorial online quickly for a project, but cannot. I have listed a few below, but do make sure that you search for it if and when you come across something that you don't know. As much as I liked a challenge, I decided to start with simple projects when I started sewing, and slowly letting my confidence increase before tackling trickier projects. Please be warned that although some sewing patterns claim to be "easy" projects, they are not! Do check how many pattern pieces there are that make up the garment - as a rule of thumb, the fewer (usually) the better. The 20 minutes skirt - tutorial here and my project here (I have made this again, but have just realised that I have failed to post my second and slightly less imperfect version). Simplicity 2451 - it's a simple yet versatile skirt pattern, in fact, it was rated as one of the best patterns in recent years. I've only made it once so far, but have no doubt that it will reappear on my sewing table this year. Ok, I think that gives you plenty to start on! Just one more note for people who may want to focus on making home furnishings, as opposed to dressmaking- I really enjoy Cath Kidston's Sew! and am sure that you will love making beautiful items for your home, and also the free bag that's included in the book (including the label!). There's also the Kindle case, the baby blanket, lavender bags and so on that can keep you entertained. Finally, welcome to the wonderful world of sewing! and remember, patience is key when it comes to such a fine craft - if you can give your garments the attention that it deserves, you will end up with beautiful items in no time! It is such a rewarding hobby (um, you get tangible clothes from it!) and opens the door to the best community full of so many inspiring and lovely people - enjoy! 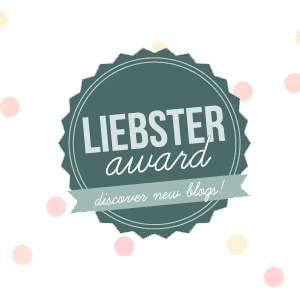 Before Christmas, Jen and Elena kindly nominated my blog for the Liebster Award. Hooray! This was the first ever blog award that I have received! I have finally got round to doing a blog post for this, and to pass on the award. 1.What's the most rewarding thing about blogging, for you? Being able to document my sewing adventures, and (can I have two “most” rewarding things?) truly feeling part of the lovely sewing community. 2. What's your favourite book? 3. Are you a morning person, or a night owl, and why? Definitely a night owl, as I struggle to get up most mornings, but always seem to have too much to do every day to actually go to sleep. 4. What are you hoping Santa brings you this year? Ah oh, I think I’ve managed to miss the window for this question! 6. Who has been the biggest inspiration in your life? I think I have taken inspiration from almost everyone that I have met/come across, for different things. I am quite easily influenced/swayed by others (read: very indecisive) and I do enjoy being inspired by everyone and everything. I am still trying to come to terms with the fact that Desperate Housewives are finished for good, but I am slowly (cough) being drawn to the stunning series of Mad Men. 8. What's your favourite thing to do at the weekend? 9. Other than the current one, which era of history would you most like to have lived in? That will depend on which part of the world I’d be living in, and honestly, history is not my strong suit. 11.Who would you most like to be trapped in a lift (elevator, for our non-English friends) with? I have passed my driving test, but I am too afraid to actually drive. Sewing has not put a stop to my shopping, though it has changed what I would/would not buy – thankfully I have not learned to make shoes! I used to be able to ride the unicycle, but when I got onto one about a year ago, I could no longer do it! I have entered the prize draw for the Vienna New Year’s Day concert every year for the last few years, and am still waiting to win the privilege of being allowed to buy two tickets. I think all of the above qualify, as they have less than 200 followers, but I am not certain whether any of them has already received this award in the past. 2. Favourite project so far? 3. When do you find the time to sew? 5.Are you a self-taught seamstress or have you taken any classes? 6. How long have you been sewing? 10. Favourite pastime, other than sewing and blogging? 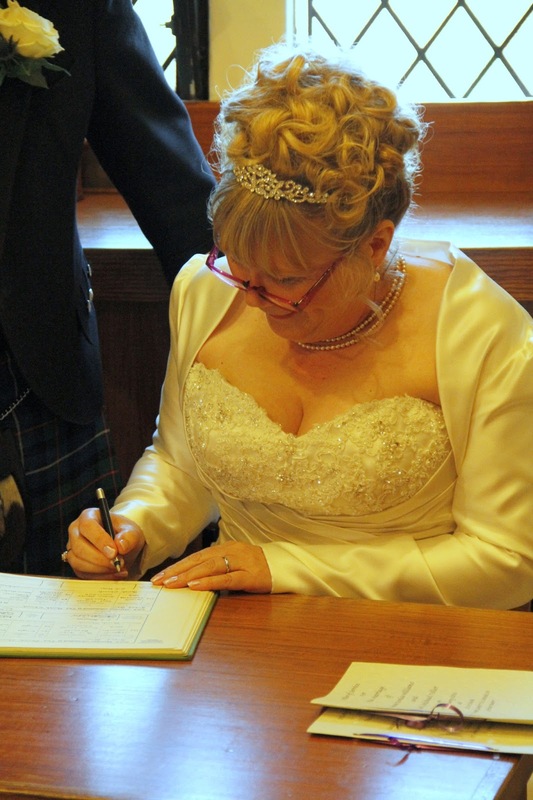 The wait is over - my mother-in-law's wedding took place yesterday! Everything was perfect - the sky was so blue, the sun was shining, and the wind blew the confetti up in the sky which was simply beautiful. I'm pleased to report back that the wedding outfits worked well, too. First up, the bridesmaid outfit. After quite a lot of effort (especially after my toile a couple of months back), I finished Butterick 5457, with crepe backed satin in purple and lilac. I teamed it up with the bolero, which kept me warm(ish) most of the day. Pattern Description: Lined dresses A, B, C, D, E have fitted bodices, boning, gathered skirt and back zipper opening. Length is 2'' above mid-knee, B: contrast midriff. C: contrast bodice. D: contrast underdress. E: bubble skirt. I made a view C with a contrast bodice. Pattern Sizing: 6-12. I made a size 6 and the fit was good. But as a petite lady (5'3, 161cm), I did not need any petite adjustment to the bodice, so if you want to make this for anyone taller, I would consider lengthening the bodice. Did it look like the photo/drawing on the pattern envelope? I think so! Were the instructions easy to follow? Other than the pattern pieces (the lack of mention of the fact that one lining layer was really underlining until you start sewing), the instructions themselves were fine. I think marking this pattern as "easy" is, however, misleading. What did you particularly like or dislike about the pattern? I really liked the design, as I think it makes a wonderful pattern for a bridesmaid dress. The pleats were lovely, but I didn't want gathers in my skirt for a formal dress. Personally I think the pattern could be slightly better drafted - For the lining layer where boning is inserted, I ignored pattern pieces 3,4,5 (bodice),8 and 9 (midriff), and redrafted them so that the bodice and midriff pieces are one (if that makes sense - so in total my bodice lining had 5 pieces - one centre front, two side fronts and two back pieces). This reduced bulk at the waistline, and made inserting boning a lot easier. For the midriff pieces (for the fashion fabric), I had great trouble stretching the edges with a acetate satin for my toile. However, using crepe backed satin this time, although I left plenty of excess to the sides, the fabric stretched far enough on the bias. I would recommend testing the stretch prior to cutting, in case you are using fabric that is stubborn. 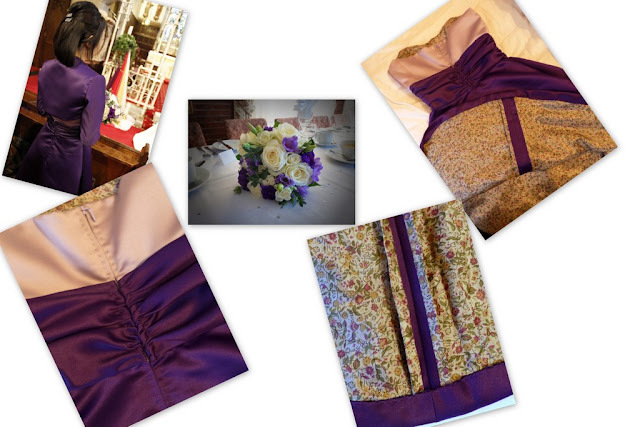 Fabric used: I used thick crepe backed satin in purple for the midriff and skirt , and the same fabric in lilac for the contrast bodice (purchased form Royal Fabrics in Leamington Spa). I used a floral viscose lining too (purchased from Decorative Cloth, also in Leam). I also used spiral steel boning (from Vena Cave designs online). Would you sew it again? Would you recommend it to others? I would not sew it again as this was for a special occasion, and took me quite a long time to complete. However, I would recommend it to others who are more experienced sewers, rather than beginners (despite the claim to be an "easy" pattern), but would recommend a toile strongly. Conclusion: I think it is a pattern with a great design, but not perfect drafting. I would recommend spending some time over the pattern pieces before starting to cut and sew to get lovely results. Didn't my mother-in-law look fabulous? It was such a lovely day indeed, where we celebrated the wonderful relationship and love of a truly great couple.